In the wake of the Rana Plaza building collapse in Bangladesh, it's time to re-evaluate what we wear and where we get it. In the wake of the current building collapse in Bangladesh – more than 1,100 factory workers died in April 24's Rana Plaza garment factory complex collapse – everyone's lips have been abuzz with the current catch phrase "fast fashion," a term that has hovered in the fashion realm for a while, which has now become a household name. In layman's terms, fast fashion describes clothing produced quickly to meet the demands of a trendy fashion market. Fingers are mostly pointed at the larger retailers, like Zara, H&M, Topshop, Forever 21, and Target, which sell low-cost, stylish goods that appeal to the masses. These larger commercial outlets taunt and grab their consumer by using shiny, pretty words, like Karl Lagerfeld, Kate Moss, Jimmy Choo, Rodarte, Jason Wu, and (sigh) Missoni, to lure fashion addicts into this socially irresponsible web. Fret not, my little fashion mavens – you can stay away from the bright, glamorous strobe light and still maintain your chic. But like any diet, it will take some tweaking. Let's call it counting your fashion calories. First take stock of your closet – yes, not just the clean clothes teeming out of the laundry basket – your actual closet where clothes hang. Look again in there before you buy another dress for your 15th wedding of the summer. I bet you have something that will work just fine with some new accessories. Take the classic LBD and add different accouterments. Drown yourself in turquoise and silver for a boho day wedding or take that black dress to Fifth Avenue and throw on scads of diamonds and strands of pearls a la Audrey Hepburn for an evening ceremony. That classic shift can add miles to something you already have before you even think of tossing or replacing it. Yet if you must splurge, visit your local thrift and consignment shops and try to shop locally. Speaking of local businesses, I sat down with Dave and Diane Nieratko in their new Grasshopper shop, located at 2818 W. Eighth St, to chat about Fair Trade and sustainable clothing. Diane read a recent article online, and she was astounded to find out that since the '80s, women own four times as many clothes. "They are filling up landfills," Diane explains of the recent increase in wardrobes, as Dave sat across from her in the back office of their new location. "It's the demands on the market; there are more seasons now," she continues, fervidly. "It used to just be Fall/Winter and Spring/Summer. Now there's inter-seasons, like pre-fall, holiday, resort/cruise. This requires a lot of man hours – like 14 hours a day in some situations." To counteract this, Dave and Diane choose products that are Fair Trade certified. This means there's a global effort in helping countries with skills that benefit their communities. The black and white definition is this: "A trading partnership that seeks equity in international trade. It contributes to sustainable development by offering better trading conditions to and securing the rights of marginalized producers and workers," as told by FINE, an association of the main Fair Trade networks. "We sell Zulugrass beads, which benefit the Maasai men and women in Kenya. We also order from Serrv, a Fair Trade and nonprofit organization to eradicate poverty by providing opportunity to artisans and farmers," Diane tells me sitting up in her seat. "Another great thing about Fair Trade is the connection to the culture. It's not just another item made in China. It has a story, authenticity, a heart," Dave says about the benefits of buying consciously. What does buying Fair Trade mean for the farmer and artisan? Fair Trade USA explains it like this: "Funds are specifically designated for social, economic, and environmental developmental projects. A democratic system is in place where each community determines and votes on how the earned funds will be used." The websites continues: "The agreement enlivens developing countries, relieves exploitation, and promotes environmental sustainability." As far as our abuzz lips go, the stone tossed into the river of tragedy in Bangladesh has caused a ripple effect. This reaction has birthed the Bangladesh Safety Agreement. But the scary thing is 14 North American retailers have chosen to not sign the agreement, which calls for a five-year commitment from retailers to conduct safety inspections of factories and pay up to $500,000 per year towards safety improvements. So here's who they are: Walmart, Gap, Macy's, Sears/Kmart, JC Penney's, North Face, Target, Kohl's, Cato Fashions, Carter's, Nordstrom, American Eagle, The Children's Place, and Foot Locker. Here's a few who have signed: H&M, Benetton, Calvin Klein, Tommy Hilfiger, and Abercrombie & Fitch. Surprising, eh? So when shopping, take a stance: know how much is enough, know from where your clothing comes, and have a plan for the lifetime of the article. In other words, think beyond the rack and shop informed since even the smallest article of clothing can have a global effect. Want to know more about this topic? Check out Elizabeth L. Cline's "Overdressed: The Shockingly High Price of Cheap Fashion." 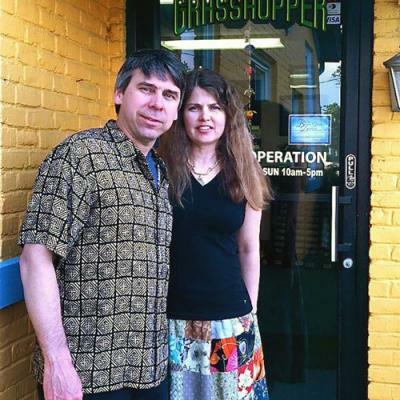 Grasshoppers' Dave and Diane share why Fair Trade is a win-win for all and fast fashion is a thing of the past. Visit Grasshopper in two locations: 2518 Peach St. and 2818 W. Eighth St. next to Joe Root's.